The utility of DNA extracted from formaldehyde-treated specimens for use after PCR amplification in molecular systematic, biogeographical, and ecological studies is uncertain. The molecular value of our current fluid-stored specimens is being assessed through the study of fluid stored fish from the collection of the NMNH. The project involves the assessment of DNA extractions, ability to amplify DNA and to obtain accurate sequence information from a collection of neotropical fish in the two collections of NMNH. 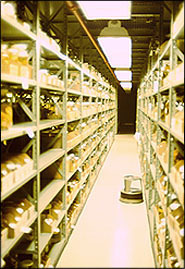 This storage has an undetermined impact on the future utility of the specimen for some more recently emerged types of scientific investigation. Modern molecular techniques, particularly the polymerase chain reaction (PCR), open up the possibility that a variety of museum specimens will be useful in expanding molecular-based questions.The techniques will also allow investigations that require museum specimens as sources for studies of biodiversity and biogeographical alterations or molecular systematic investigations of extinct taxa.